Compendium: What should you know about the Internet domain? Without a website address, i.e. a domain name, nobody will visit your website. Maybe apart from magicians who know the IP address of the server on which it is located and know how to use it. Anyway, can you imagine visiting the Internet by typing a complicated sequence of numbers to see your favorite service? I can’t imagine it! Fortunately, someone invented an Internet domain that makes it easier for us. And this is what the compendium will be about. I will try to discuss the most important topics related to domains, mainly the Polish domain. What does the Internet domain look like? How do I choose a name for my domain? How to take care of your domain? What is needed for domain transfer? How does domain transfer look like? What is a domain option? Simply put, a domain is a unique name throughout the Internet that identifies a resource on the Internet, a website, an e-mail address, a server address. This name consists of a sequence of characters separated by dots, where the top level domain is always located at the very end. For Poland it is .pl. Other countries have their own endings, such as Germany – .de. The Internet domain name has some limitations (e.g. maximum 63 characters, not counting the .pl extension). It may consist only of letters of the Latin alphabet, digits and the “-” sign. (minus). The “-” sign cannot appear at the beginning, at the end and simultaneously at the 3rd and 4th position in the domain name. The exception is IDN domains. It is a special technological platform that enables the exchange of telephone numbers from the E.164 standard to the Internet domain address. For ENUM, obtaining an IP address (e.g. a server on which there is a WWW server serving a domain) is not crucial, it is first of all about connecting various telecommunication services with a phone number stored in the form of an Internet domain. For more information, please visit dns.pl/ENUM. The IDN (Internationalized Domain Name) is actually a domain with tails. Thanks to this technology, it is possible to register a domain that uses diacritical national characters specific to the language. 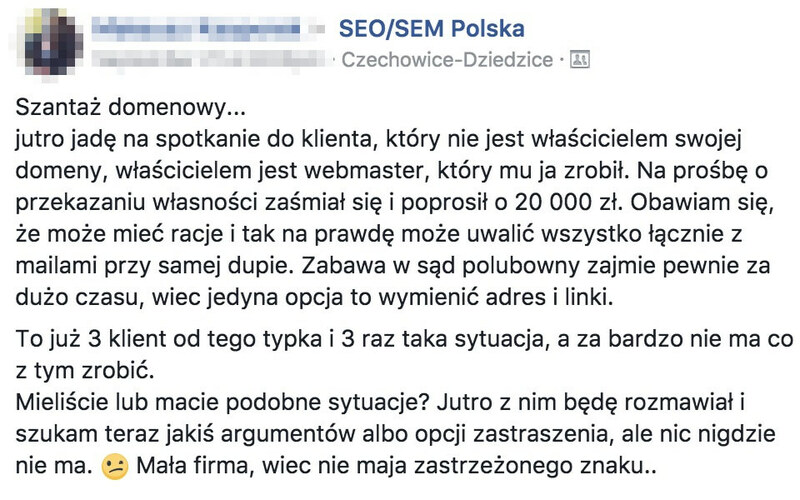 W przypadku polskiej domeny internetowej mogą to być znaki typu ś, ć, ą. Dzięki temu możemy zarejestrować domenę typu żółw.pl, a nie zolw.pl. Z technicznego punktu widzenia, domena żółw.pl (postać unikodowa) wygląda jednak tak: xn--w-uga1v8h.pl (postać ASCII), aby sprostać ograniczenim, jakie stawia domena. In the case of the Polish Internet domain, these may be ś, ć, ą characters. Thanks to this we can register the domain type żółw.pl, not zolw.pl. From the technical point of view, the domain żółw.pl (unique character) looks like this: xn--w-uga1v8h.pl (ASCII form) to meet the limitations of the domain. Nothing stands in the way of registering the domain черепаха.pl (turtle in Russian). However, please keep in mind one limitation. It is not allowed to mix characters from different language sets, which means that it is impossible to use Cyrillic, Polish petioles and Hebrew letters in the name at the same time. An interesting fact is that NASK is the first registry in Europe and one of the first in the world to introduce the possibility of registering IDN domains. Before registering an Internet domain, it is a good idea to consider its name. Will it be a regional domain, IDN or a foreign domain? Think about it before you make your first purchase. We can also think about buying a new name with Polish signs. It will be easier to dictate such an address to someone over the phone than to break your language by removing “tails”. See how to easily register a web domain. By registering an Internet domain, you become its subscriber, not its owner. As long as we pay it to our registrar, we can use it for as long as we can. Remember to register the domain on yourself or your company, and not on the data of the agency that executes your site, or on the data of a colleague because he knows it in computer science. When registering an Internet domain, it is worth remembering a few rules to ensure its security. First of all, make sure that your domain does not expire. For example, you can pay for the .pl domain 10 years in advance. If you forget to pay for the domain, do not panic. It does not disappear immediately and for some time you can still recover it. This is called a quarantine buyout. Another very important thing is to ensure that your contact details, in particular your e-mail address, which are stored in the Domain Registry, are up to date. There is nothing worse than registering a domain to an e-mail address to which we have lost access, or these are the data of e.g. an agency that makes a website for us. What happens if your domain is not registered to you. You can always change the current data by contacting your domain registrar. Any information about changes to your domain name is sent to the e-mail address provided in the Registry. In case of the .pl domain, you can make sure that your registrar is an official partner of NASK or that it uses the chain of intermediaries. You can always change it easily by using the transfer option. The Camels company is the official registrar of the .pl and .eu domains. We have a partnership with NASK and EURiD. Domain transfer is a change of the domain registrar, i.e. the company that will support it from the technical side. Domain transfer does not change the domain subscriber. The main reason for the transfer of domains is the transition to a company that has a clear price list for domain fees. Many companies “tempt with a promotional price” for the first period of domain registration (e.g. : domain for 0 PLN), then the promotional conditions are designed in such a way that in order to use a given domain, we have to pay twice as much for the following years. It is also worth to transfer the domain to a hosting company, so that everything is paid for in one place. It often happens to clients that after paying for the server, they forget to pay for the domain and their website stops working. Transferring domain support to another operator is very simple and usually requires the same steps for most domains. In case of .pl domain the transfer is free of charge and does not change the expiration date of the domain. It is worth remembering that each Domain Registrar has its own procedures, e.g. transfer of global domains is paid, but it extends its validity period by one year. Other such differences are the dates when such a transfer can be made. For .pl domains it takes 5 days after its registration or transfer in order for the next transfer to take place. In case of global domains like .org, .com – it is 60 days. The .eu European domain has no such restrictions. To transfer a domain to another registrar, you will need to obtain an Authinfo (sometimes called Authcode or EPP) authentication code from the current registrar. Each registry shall have its own procedure for obtaining such a code. Some companies require you to complete an application form and send it by post. Exactly the same method is used to send back the code. This is very cumbersome and time-consuming. What’s worse, such a recorder sets the validity time of the AuthInfo code to expire before the mail delivers the letter. Therefore, if you want to transfer the domain from such a registrar, you should be interested in it much earlier and not leave it at the last minute. At your request the registrar is obliged to issue an authinfo code immediately. The Registrar cannot make the issuance of the authinfo code subject to additional conditions, including payment of a fee. Virtually every domain registry has a possibility to obtain a code and report a dishonest registrar in an emergency. Before obtaining an authorization code, the Registrar must ensure that it is requested by the actual domain subscriber and not by a third party. The authorization code should be given to the new recorder in a secure way, e.g. via the client panel. Domain transfer usually consists of four steps. As an example I will use the .pl domain. Initialization of the transfer by a new recorder. Initiation of the transfer is possible at the earliest 5 days after the registration of the domain or its last transfer. Approval of the transfer by the subscriber. The last step is the most important! The domain subscriber receives an email from the domain registry with a link to accept the transfer. If the link is not clicked, the transfer will not take place. Therefore, it is important to always have up-to-date data in the domain registry. After the transfer is confirmed, the .pl domain will be transferred to the new registrar immediately and e.g. in case of global domains it will take up to 10 days. Each Internet domain has its own life cycle from registration to expiration. You can check the current status of your domain in the WHOIS database. 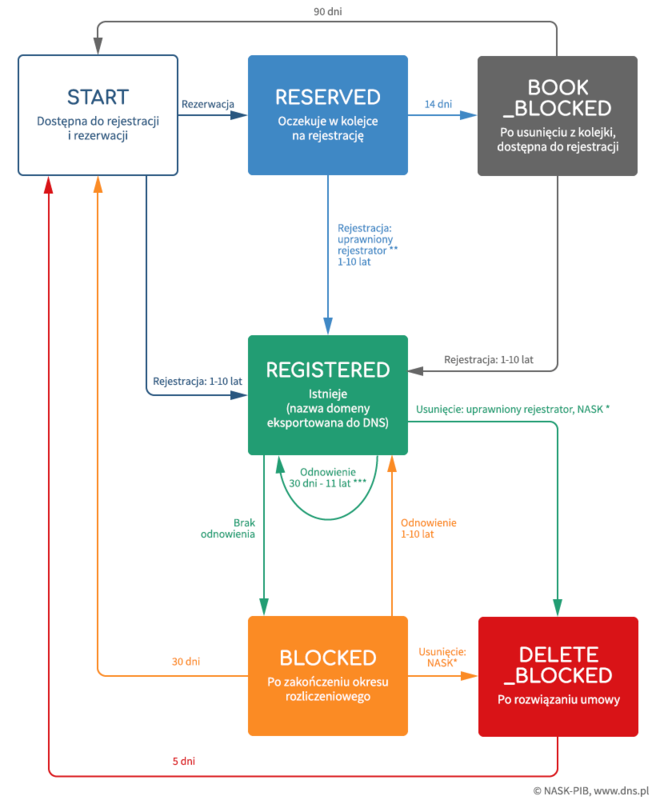 Life cycle of the .pl domain. If the domain is not paid for on time, it becomes BLOCKED. For 30 days the subscriber can still recover the domain (buy it out of quarantine for an additional fee). After this time the domain will be returned to free domains and everyone will be able to buy it. For example, a domain in BLOCKED status can be moved to another recorder, but the DNS delegation can no longer be performed. Each Domain Registry maintains a database that contains information about the domain. Such data are e.g. : on which DNS servers the domain is located, when it was registered and when it expires, who is its registrar or subscriber. on the WHOIS service server running on whois.dns.pl (port 43), which can be used using standard tools, e.g. whois, jwhois. Fragment of the result from WHOIS database for the domain thecamels.pl. Each Domain Registry can offer different functions for its domains, such as: Registry Lock or domain option. So what is the option? This is the priority for domain registration after its release by the current subscriber. Buying a domain option gives you the guarantee that you will be the first to be able to buy a domain, provided that the current subscriber does not renew it. The domain option is useful when you plan to make sure that no one else will buy a domain that has probably been abandoned by the subscriber. Only one option can be purchased for a given domain. The option for a domain is valid for 3 years. Fortunately, you don’t have to verify this e-mail address every time. It is sent only once for verification purposes. Subsequent domain registrations and transfers using the same e-mail do not require verification. If the e-mail address is not confirmed within 15 days from the date of the operation, the domain will be blocked. As soon as the subscriber clicks on the link, the domain will be unlocked.